You might recall last Wednesday's posting which asked the question - is there any reason to think that it remains compulsory to shake hands before a game? As far as I'm concerned the answer is still I'm not sure, but since I can't find anything in the present rules of chess to say that the handshake is compulsory, I'm going to assume, just for the moment, that it is not. What's this about? 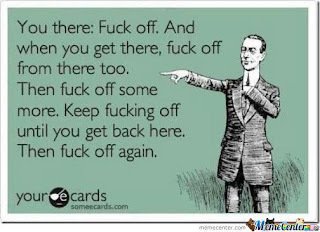 You might also recall a posting from last month in which I made plain my annoyance at opponents who turn up late for games and especially those who can't be bothered to apologise for their late arrival. My own apologies, by the way, for not responding to the interesting comments that followed - by the time they appeared I was in a small Scottish village with no WiFi. 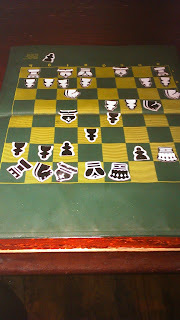 Anyway, later on in the holiday I played a weekend tournament in which, on the Sunday morning, my opponent arrived very late for the game. No apology, no nothing. This, once again, annoyed me. Thinking on this, since then, I wondered if it might provide an opportunity for a little exercise in comparative ethics. Many people think it's unsporting to start a game without a handshake: I'm not so bothered about that as I am about players arriving late for games. For my part, I think it's discourteous to turn up late with no apology to the opponent. So what I propose is that the next time this occurs - an opponent turns up late, lets say more than ten minutes, and without any apology - I refuse any handshake that they offer. On the grounds that I consider their conduct unsporting and hence see no reason to greet them "in a normal social manner". Chess, as we well know, is evil. 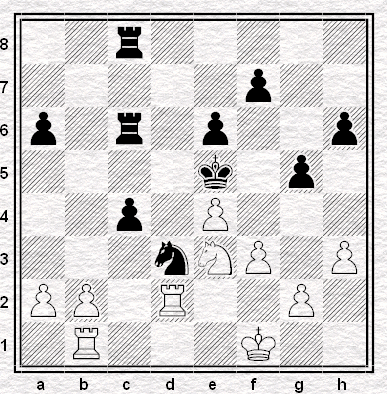 Play chess and you go mad: do evil, and it's probably because of your chessplaying character. Another example this past week, from the Economist. 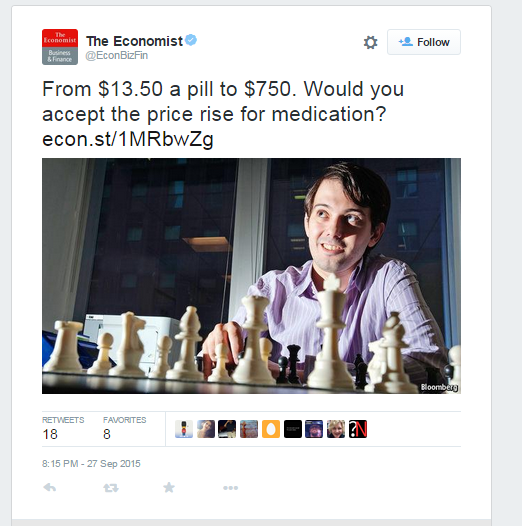 Yes, that's unfunny comedy-villain, Martin Shkreli, who saw fit to raise the price of a vital drug by around 5500%, and never mind who gets bankrupted or dies. So how, is he portrayed by the Economist? How do you portray the face of evil? 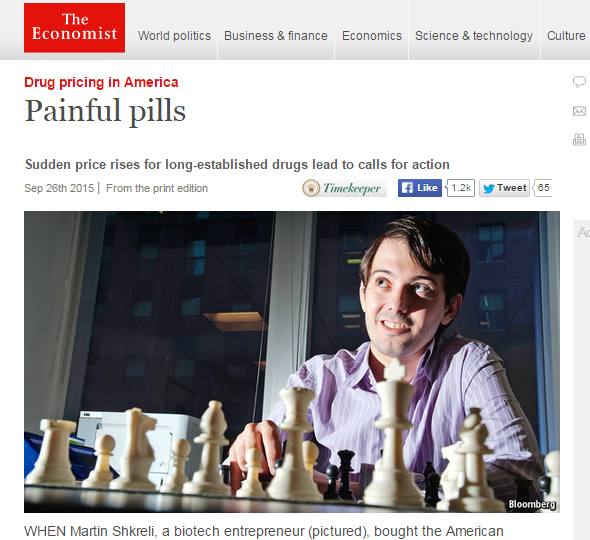 Obviously, they photograph him behind a chess set. 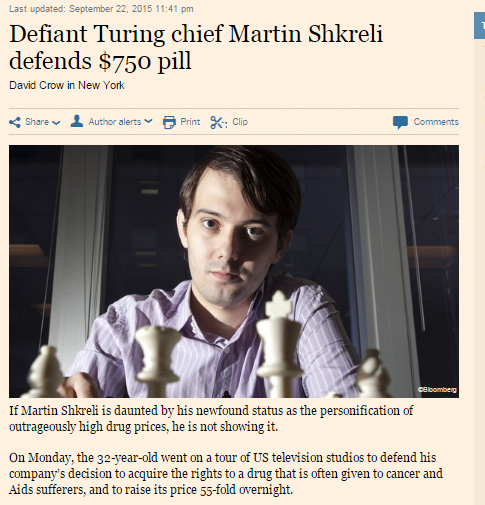 The FT have done the same and all. 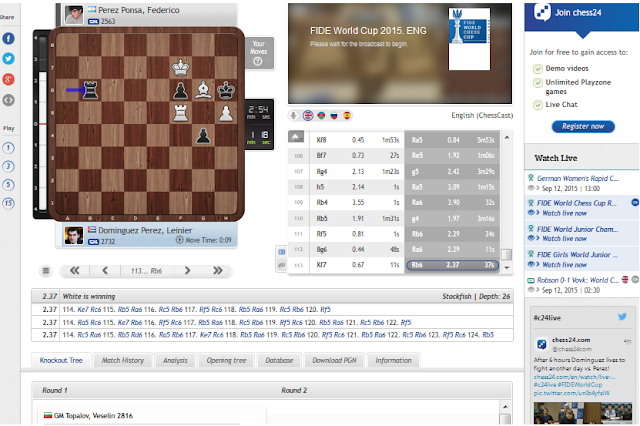 An occasionally entertaining feature of Chessdom's World Cup coverage is the three computer programs which sometimes offer quite different assessments. 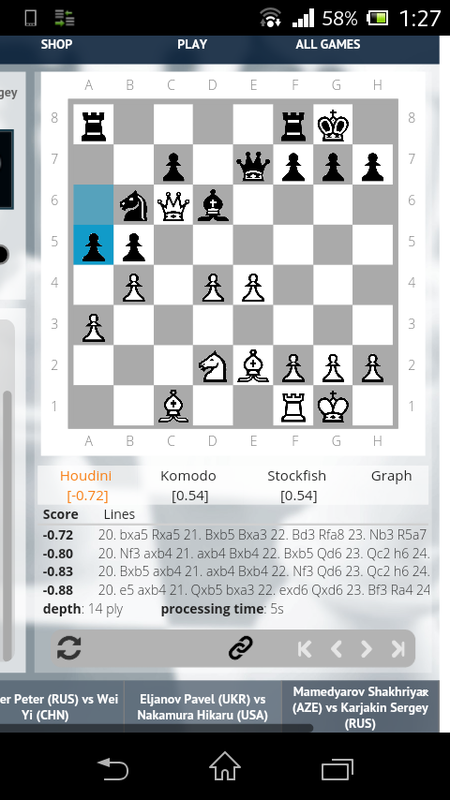 I particularly liked this moment from the first Mamedyarov-Karjakin game, Komodo and Stockfish both substantially favouring White: it's not just that the evaluations are different, but that they're basically opposite, with Houdini supporting Black by a roughly similar margin. I would love to know why...if I thought there was any chance I'd understand. 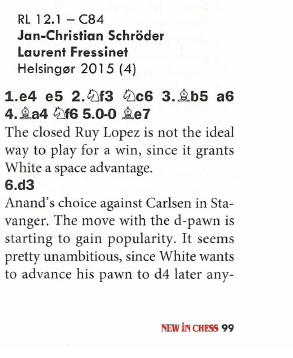 Jan Timman, "Danish Delight", New in Chess, 2015#6, pages 99-100. Question: since the Open Ruy Lopez is characterised by the move 5...Nxe4, how, in selecting 6. d3 after Black has played 5...Be7, has White succeeded in avoiding it? Since rule violations and their ambiguities involved in their enforcement seem to be the theme this week, let me take the opportunity to raise a question that has been bothering me of late, which is - what precisely are the current regulations on shaking hands? Players are penalised for poor sportsmanship e.g. for refusing to shake hands with their opponent. This may be right. It's possible it's right. But is it right? I'm not sure I can find anything written down that says it's right. 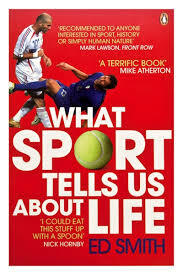 I re-read Ed Smith’s What Sport Tells Us About Life yesterday. Part of it, anyway. Specifically, chapter 10: When is Cheating Really Cheating? I often find myself returning to this book. 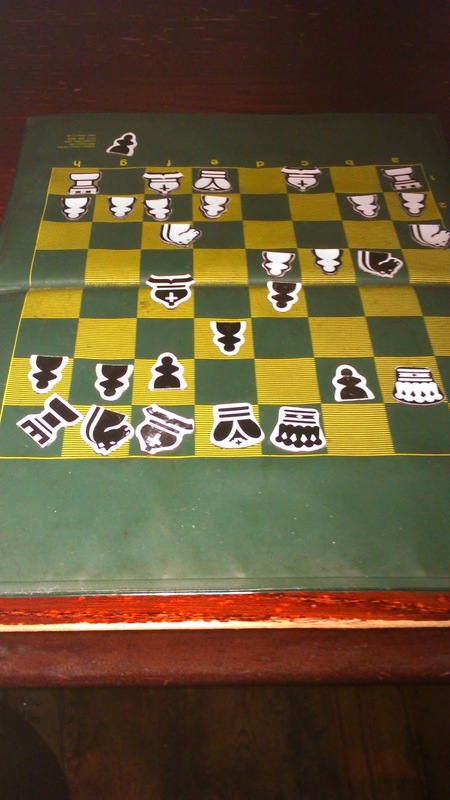 My inspiration this time was the brouhaha that blew up after Nakamura's double-handed castling in the Armageddon game with Nepomniachtchi at the weekend. Nobody likes a cheat. Neither players nor spectators. Not in any sport. That’s how Smith begins, at least, and I think we’d all agree. Pretty quickly, though, he proceeds to drive a coach and horses through any certainty the reader might have had about what constitutes cheating. Not walking, but waiting for the umpire to give you out when you know you’ve edged a catch behind - considered acceptable (these days). 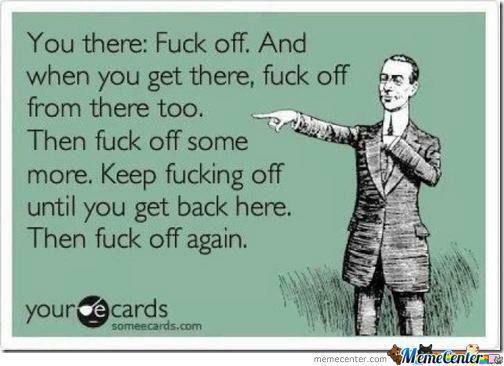 Claiming a catch when you know you’ve not taken it cleanly - very much not acceptable. Ball tampering. Not acceptable, but it’s 'everybody does it’ commonplace. The latter caused an international incident in 2005 when Pakistan were the equivalent of defaulted for not coming back out to play after they were penalised five runs for messing around with the ball during a test against England. "Arguments about cheating in sport revolve around conventions more than laws. It’s not only a question of "Was he breaking the rules?’ but also 'Is that rule sacrosanct?' It is the unwritten constitution that exerts the stronger grip. So what about Nakamura? Using both hands to castle is obviously against the rules, but is it cheating? Not really, I would say. It’s far too minor an infringement of the rules to deserve that label. Or maybe I mean it’s an infringement of a minor rule. Whatever. 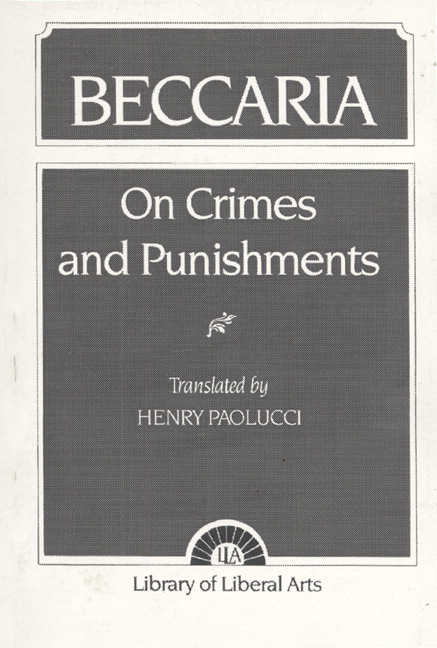 The principle that the punishment should be proportional to the offence dates back to the late 1700s and the 'Father of Criminology' Carlos Beccaria, if not further. Certainly, the post-hoc award of a win to Nepo on the grounds that Naka had used one hand more than usual to switch his king and rook would have been an absurd over-reaction. While Nepomniachtchi’s appeal rightly failed, the very trivial nature of Nakamura’s actions make me think much less of him too. Double-handed castling is like littering. The impact on everybody else may be small, but it really isn’t difficult to keep within the norms of acceptable behaviour. Anybody who fails to do so is making a pretty clear statement about their priorities. The same - and here I finally get around to why this post is included in the DG series - is true about claims regarding chess and dementia. It’s really not hard to avoid making vague unsubstantiated claims in this area. Not hard to avoid saying things like, "There are many studies showing positive effect of chess on delaying, improving dementia/Alzheimer's" (Doctor Garry is In) or any of the other equally dubious claims that have we’ve seen in these posts over the past 18 months or so. Not hard, that is, if you have even the slightest sense that what you might happen to feel like doing or saying right now does not necessarily trump the conventions by which everybody else lives. Let’s not spread misleading or outright factually incorrect information about health matters. Let’s not use both hands when we castle. Let’s not drop litter. Whether or not it matters that much to anybody else if we do these things, let’s not be bellends. Let’s just not do any of them anyway. Howell-Lercel, King's Place, round one, 11 July 2015. Position after 61. Rd2-a2. 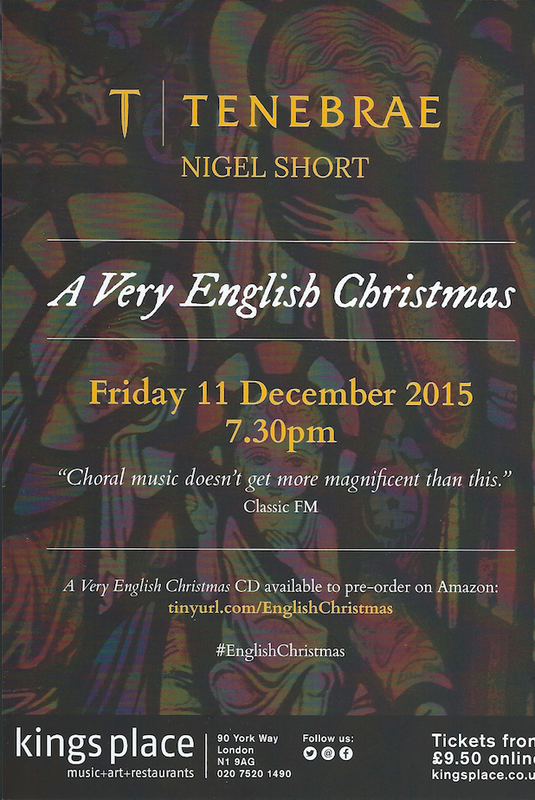 Thanks to PG in comments to Tuesday's entry for drawing our attention to this one from earlier this year. 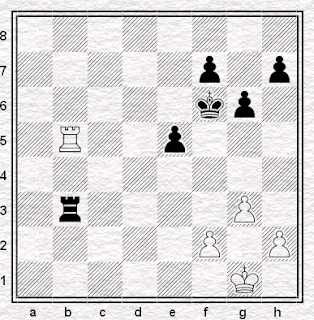 Michal Lercel found the worst move on the board - can you? After this, and this, now yet another London buildings chess set. Enough! This one is being auctioned in support of Open House 2015 - which may be of interest to London readers this weekend (if you get your skates on). Go visit a chess piece. This is the second episode of a series exploring chess and the Bloomsbury Group, the idea for the which was provoked by the absence of any chess in the BBC2 docudrama Life in Squares. 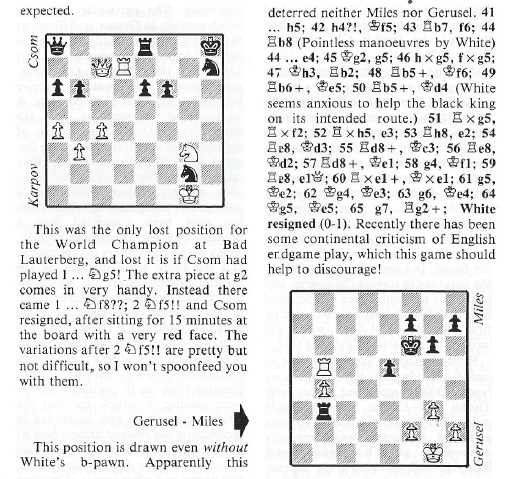 These blogs aim to repair this omission: an inspection of the Bloomsbury literature shows that the Bloomsberries played chess. A lot. 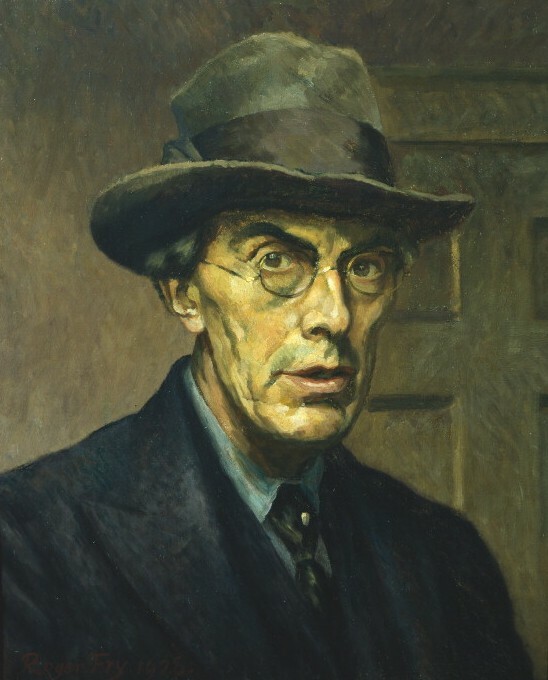 Perhaps none more so than Roger Eliot Fry, the subject of this episode (which, with the others, has been written with non-chess players in mind). Fry (1866-1934) was one of the original Bloomsberries, and the oldest. He spent his life immersed in all aspects of art; and so committed to it was he that it's a wonder he had any time at all for chess. However, an examination of the record suggests that his chessic inclinations were only visited on him later in life, when he gives the appearance of a convinced chessoholic enjoining in a game anyone not quick enough with an excuse to do otherwise. We'll make the case for this assertion below, based on numerous accounts from the Bloomsberries themselves. First time I've done this feature for a year and like the last one, it's Karpov World Championship preparation. Well, what do you expect, these were my formative years in chess. On this occasion though, the madeleine which summoned up the memory of youth was a game I played myself, at the Bank Holiday congress in Golders Green, first round, available on the playthrough below if you think it's worth the effort. It's not the first time I've played the line: that was at Benasque four years ago, when I lost to Delchev in what I will always think of as the Immortal Tippex Game. 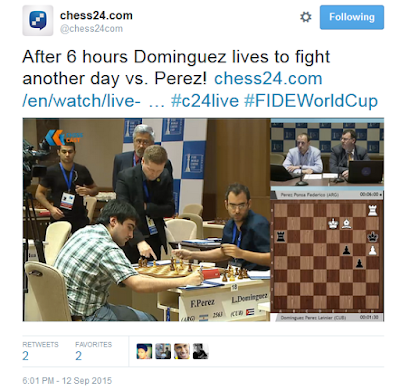 Bruzón Batista-Vidit, FIDE World Cup, round one (3) 13 September 2015. Position after 38. Nd1-e3. ...but he never got there. Matter of fact his next move avoided getting there as quickly as it possibly could. It’s been a bitterly fought campaign. With accusations and jibes thrown by the minute, you wonder how the major players can possibly work together hereafter. Surely the future can only bring yet more bloodletting and acrimony. Splits may emerge that take decades to heal. But enough of the Labour party and Jeremy Corbyn, let’s get back to the English Chess Federation. 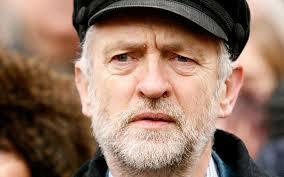 Fancy a job with the ECF Jeremy? Over on the ECF Forum I’ve been asking why I should be giving much of a monkey’s about our elections. What with having no vote despite having a requirement to pay an annual membership fee and all. Thus far I see no convincing argument as to why I should. If I did care I think I might be making much more of a fuss about the ECF’s priorities. I might be asking why there’s so much chatter about the effing of offs and nothing at all about the our game’s national body turning itself into the Daily Express in front of our eyes. Uh huh. Unsurprisingly, the ECF entirely failed to substantiate this claim when asked for evidence (see DG XXVII: The ECF vs Mrs Sally Williams). 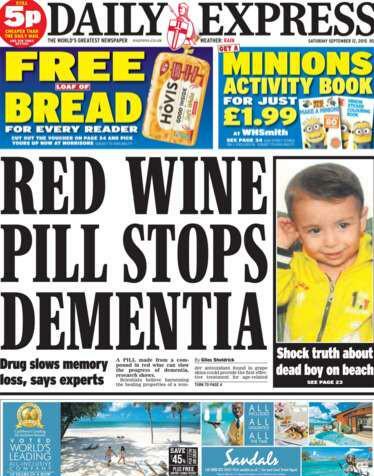 The Daily Express, the very definition of a lost cause, are notorious for their baseless "[whatever random thing they happen to feel like that day] beats dementia" claims. Their latest shouty frontpage headline, reproduced at the head of today’s blog, appeared this very weekend. 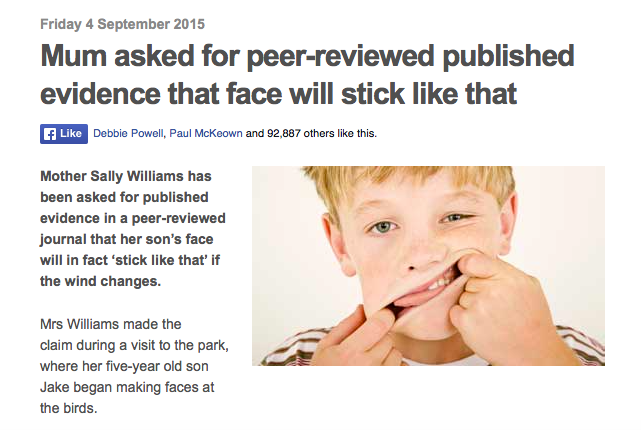 DG V: In the News has twenty more. The ECF, though? I hoped for better. I certainly expect better. I could demand better, but why bother? Nobody would listen. Why would they? It’s not as if I’ve got a vote or anything. I was watching the World Cup yesterday evening,following the game Domínguez Pérez v Pérez Ponsa in which the latter, needing to draw to make it through to the next round, was struggling to hold on in an ending a piece down: in fact it looked, after a long struggle, which had reached 113 moves, as if he might just have let Domínguez in. There were the scoresheets being collected. I'd forgotten, there was a delay in transmission to try and combat cheating. Fair enough, but having followed the game all afternoon, I felt pretty cheated myself in having been told the result before the end of the game. 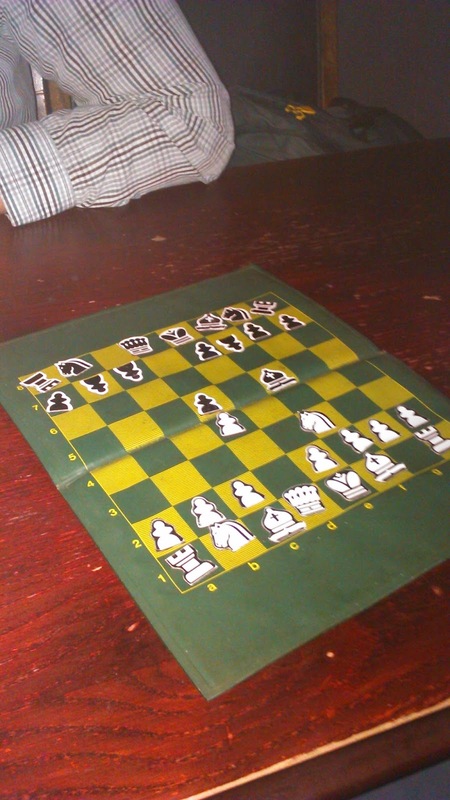 The night before the Bank Holiday tournament at Golders Green I was drinking with Angus and Dave down the Earl Ferrers, which I knew used to have a chess set, because I've had it on a table in front of me: the barman couldn't find it though (a perhaps superior variation on the usual theme of finding the set but not finding all the pawns) and offered me Jenga as a substitute, a suggestion I declined by use of the eyebrows rather than the mouth. 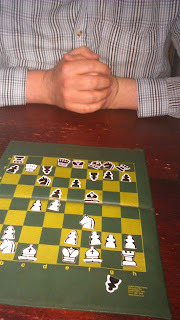 So we made do with Angus's magnetic set, which had the correct number of chessmen but an incorrect number of chessplayers to play with it. Unless one player sits out while the other two play - or unless you play one game, with two sides and three players. It's a way of playing, and more fun than you'd imagine: perhaps there's not much point in laying traps that you're not going to fall into, but at least you can head for complications in the knowledge that you'll be as lost on the other side of the board as the one you started on. We played two games, of which we won one, drew one and lost one. The second (of which the opening stages are pictured) was a particularly good game. If only I could remember how it went. Sorry about that. You probably didn't want to see that. You probably didn't want to see this either. 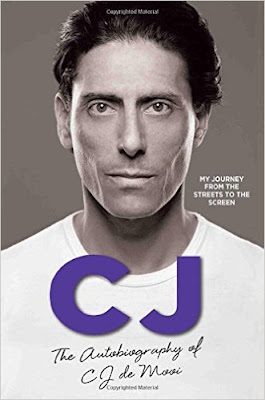 Yes, it's pathological liar and professional self-publicist CJ de Mooi, in confessional mode just in time for his autobiography to come out. 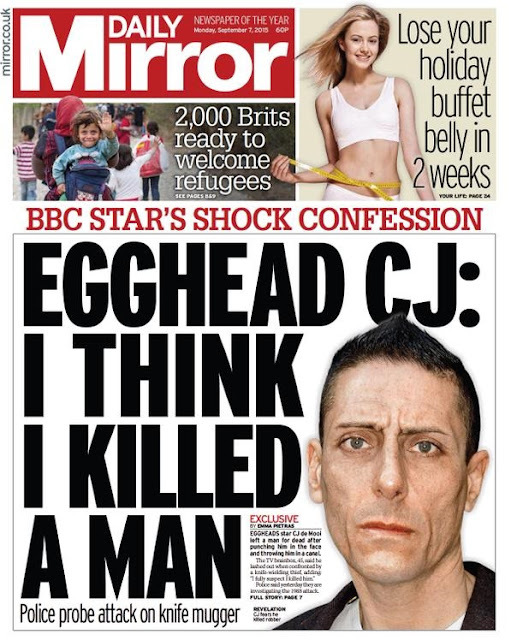 When I say "confessional mode" the confession is that he killed a man, about which I'd be more concerned if I didn't think the man involved was fictional. But still, by his own account, what does that make CJ? I think I like that kid. That pretend kid, I should say. Yes, on the off chance that Jack Warner might wander by today, I should probably start by making absolutely clear that News Thump is a website that publishes spoof news stories. from Non-Executive Director John Foley in a piece for the Sport and Recreation Alliance. This series is a bit off the pace, but the idea of investigating the chess-playing tendencies of the Bloomsbury Group only occurred to me as the three-part TV docudrama Life in Squares was beginning on BBC2 back in July 2015. I had an inkling that they played a bit of chess having come across two of them at it in a photograph a few years ago (see here). So I watched the series with optimism. But, alas, the film's makers overlooked the exciting tele-visual possibilities offered by our noble game: there was not a pawn pushed in anger, nor a piece taken with passion. Hence this series of posts to put the record straight. A close inspection of their writings suggests that many of the Bloomsberries could and did play, though as we all know, having the moves doesn't mean you can "really play" chess; and it is not so surprising, perhaps, that they should know, even if superficially, a game with such an aura of depth and profundity - it was likely to have been a class/public school thing. This series, though, won't examine all of the several Bloomsbury chessers. Instead, the focus will rest on just three or four for whom chess was perhaps a bit more serious, even if for one or two of these it wasn't much more than a compulsive pastime. For one or two others, however, chess was, as I discovered, a serious diversion at some time in their lives. Collectively these four will be the hooks upon which the episodes will hang. Around these main chess characters other Bloomsberries will be slotted in, so long as it doesn't get too confusing or protracted. Incidentally, in following the chess in Bloomsbury trail I have wandered occasionally from the straight and narrow to note some associates of the Group. They turn out, here and there, to be worth the detour. We will follow the characters, whether hard-core or peripheral, in a very approximate chronological order. I hope that the series will appeal to, and interest, Bloomsbury Group aficionados and chessers alike - but as the Venn overlap is likely to be small I have provided explanations of what the others' fuss is all about. At Appendix 1 there is a chess player's Bloomsbury Briefing of my own fashioning; I hope it will be helpful. 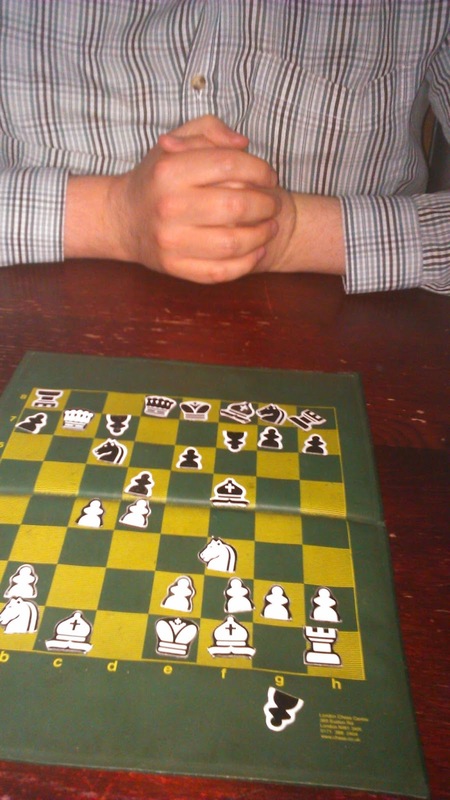 Reciprocal briefings for Bloomsburyphiles on the chess will occur as we go along. Appendix 2 to this first episode explains how I approached the task in hand; and thereby give an explanation also of its shortcomings. There is also a list of sources at the end of each episode, so references intialised in the main text can be decoded accordingly. Because of all these preliminaries, this first episode - including the Appendices - is rather long. But it has got a bit of your actual chess. Other episodes in this fortnightly series may be rather expansive as well. 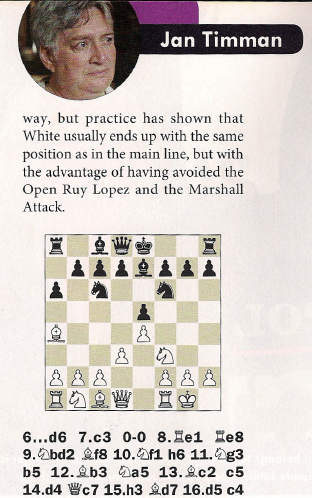 I'm flying back home today, after a short working holiday in the UK and some Golders Green chess, so in lieu of anything substantial, here's a short item that caught my eye while looking through some old BCMs recently. This is from the issue for May 1977, page 199. 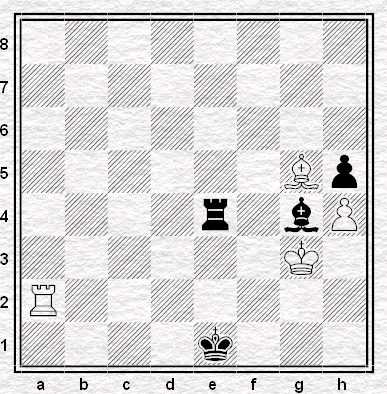 "This position is drawn even without White's b-pawn." 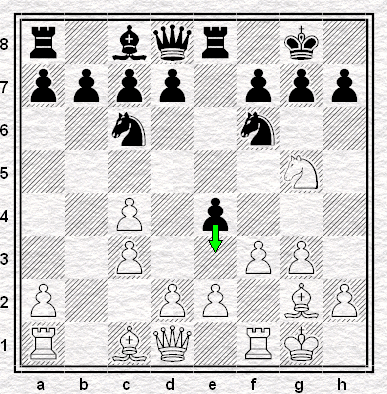 Here's the position without White's b-pawn. 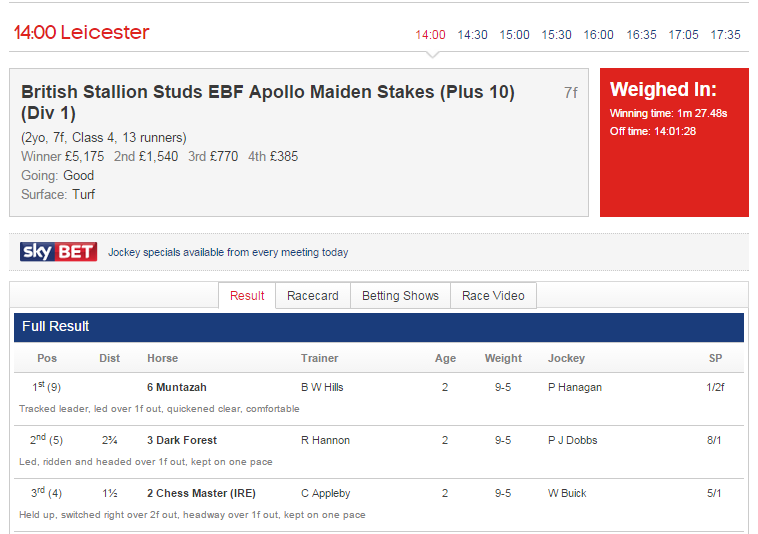 Doesn't the draw strike you as the least likely result?